The Iberian War (526-532) - The players may have changed over the centuries, but the conflict essentially remained the same. It started with the Roman Empire versus the Parthian, and eventually transformed into Byzantine versus Sāssānid. The common demoninator was their shared border. Each wanted what the other had...land. Not the first, but an early major conflict between the Byzantine and Sāssānid Empires was called The Iberian War. It took its name from a small kingdom, Iberia, in the Southern Caucasus, which was the center of the dispute. The name can be confusing since most people think of the peninsula on which Spain and Portugal are located when they hear Iberia. For this reason, the kingdom is often referred to as Caucasian Iberia. Iberian King Gourgen switched sides, from being a Sāssānid ally to a Byzantine one. Kavadh I, king of the Sāssānids, wanted Iberia back in his corner, and Justin I, king of the Byzantines, agreed to defend it. Initially, things went the Sāssānids' way. They put down the Iberian revolt and a Byzantine attack of the fortified city of Nisibis was repelled. Perhaps more alarming was the death of Justin in 527, only a year into the war. However, his successor was Justinian who would quickly show his determination. In 528, after defeating Iberia, the Sāssānid army turned south and entered Byzantine territory. But Justinian would hit with a counter-offensive and appointed the man who would become his most famous general, Belisarius, to lead it. In 530, he defeated a larger Persian force at the Battle of Dara. At the same time, both empires used neighboring kingdoms to harrass the other. The Huns fought for the Byzantines in the north, and the Arabs fought for the Sāssānids in the south. 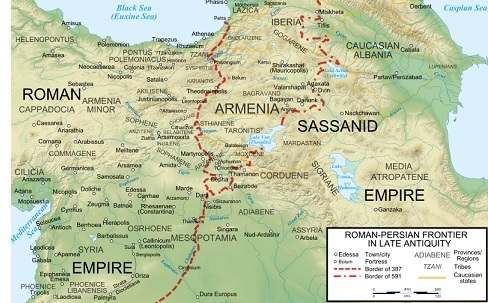 In 531, the Persians defeated Belisarius at the Battle of Callinicum, but later that year, another Byzantine force captured several Sāssānid forts in Armenia. The turning point came in 532 after King Kavadh died. Justinian had been trying to negotiate a peace with him to no avail. But the new king, Chosroes I, was much more receptive. Often times, succession was not a simple matter, and Chosroes position was by no means secure. So he was anxious to make peace, so he could solidify his hold on the crown. At the same time, Justinian's true ambitions lie in the west where he was anxious to try to reunite the old Roman Empire. Both sides signed a treaty called the "Eternal Peace" in 532, which lasted for about eight years.